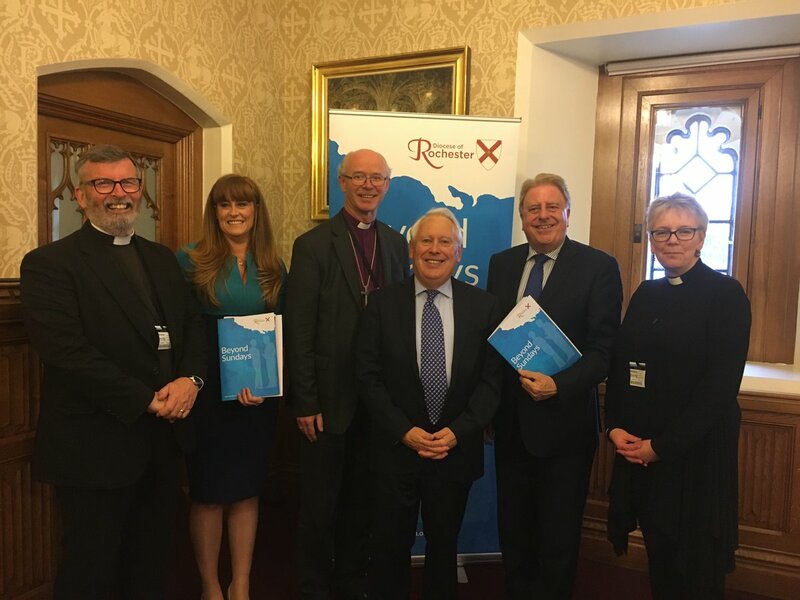 When I addressed Synod in June, I was able to bring members up-to-date about the strands of emphasis in ministry and mission which were emerging from our engagement with our parishes, chaplaincies and wider communities in the first part of this year. As I put it then, this was part of our seeking of God’s wisdom as to the shape and expression of our common calling for the years ahead. This we have been doing through discussion, sharing experiences, prayer, bible study and in many other ways. And today we are able to take that a stage further as we move towards Saturday 4th November, when we will share with the wider diocesan family what we believe God has been saying to us through this process. The whole pattern has been quite deliberately one of listening, reflecting and discerning. We have sought to hear what is already happening whether in parishes, deaneries, chaplaincies or the wider community. We have sought to hear also the aspirations where people want to go further, and to catch something of people’s sense of vision and calling for the coming years. And what is emerging from that is some real clarity and indeed common mind around some key elements of our calling. Because of the kind of process we have been using, what you are not receiving either today or on 4th November is some kind of top-down blueprint, nor even a glossy brochure. Nor are we asking you to sign up to very detailed plans or prescriptions – though there definitely will be those at the right time as we continue to develop particular strands. There is as a result a perfectly proper question as to where this sits, not least in relation to this Synod. At one level, because you have all been involved in the process and we have shared the thinking in this and other settings as we have gone along, you shouldn’t be hearing anything that surprises you very much. There will be one or two surprises (good ones) to share with the wider diocesan family on 4th November, but you will understand that I don’t want to steal my own thunder by announcing those today. What I hope you will receive today is something which draws together what we believe we have been hearing, connects that, and sets it in the context of the key Christian concept of calling. In presenting this to you today and to the wider diocese on 4th November, I am doing part of what I think bishops should do, which is to articulate the sense of common calling and vision which is being discerned from within the life and prayer of the people of God. In biblical terms we might say that we have been seeking to discover the mind of Christ, or what the Spirit is saying to the churches. And the process will continue to develop as we continue to listen to God – that is one reason why there is not a glossy publication which we can consign to some convenient shelf. That is why all we are formally asking of Synod today is that you affirm and support that continuing process (which now has a name and a shape) and in particular that you support me in taking this forward both on 4th November and over the coming years. Much more specific decisions will come to you and the Bishop’s Council in due course as the detailed implementation takes shape (and some already have, as with our clergy deployment indicators), but no such decisions are before you today. 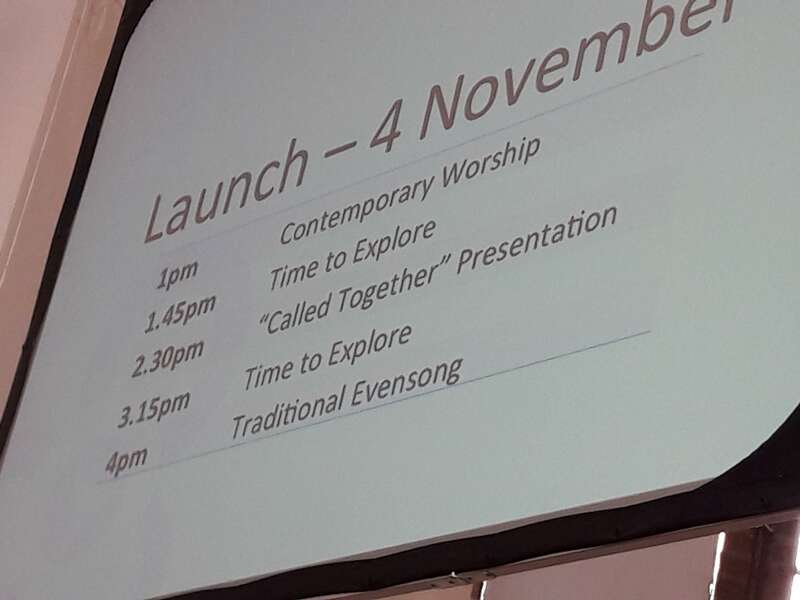 Today and 4th November are about me sharing the directions in which we discern God to be leading us, which will then guide future decisions and work by a wide range of people in parishes, deaneries, diocesan teams, this Synod, the Board of Education, the Bishop’s Council, the Cathedral and many other settings. Commission and engage in the work of evangelism. It is about enabling us to be more confident in our faith; it is about our growth in Christ-like living, the deepening of our life of prayer, and crucially it is about offering to children and young people in particular that possibility of life-changing and life-enhancing encounter with Jesus. 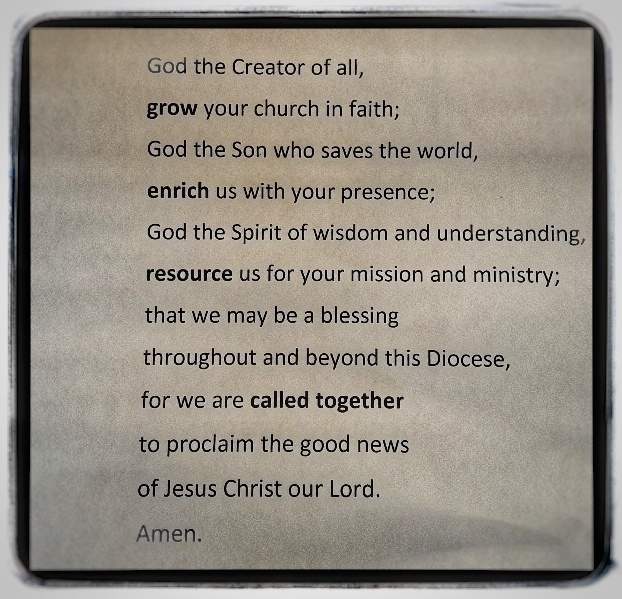 Those are all strands which sit within the theme of ‘Growing Disciples’; they all emerge from what we have been hearing, and indeed the strands of prayer and of work with children and young people really run through everything else. But that calling of each disciple by name – called into relationship with God, called into fruitful and spirit-filled Christian living – is not an individualistic thing. Indeed the Scripture verses on which the words used at Confirmation are based are in their original setting addressed to the whole people of God. It is to Israel that God says through the prophet in Isaiah 43, ‘I have called you by name, you are mine’. It is to Israel that God says in our passage this morning from Isaiah 42, ‘I have called you in righteousness, I have taken you by the hand and kept you; I have given you as a covenant to the people, a light to the nations, to open the eyes that are blind, to bring out the prisoners from the dungeon, from the prison those who sit in darkness.’ Here then is our common calling – we are ‘called together’. We are called to be together, to be the people of God, drawn together in worship and prayer, enjoying the riches of our differing gifts, characters and callings, yet drawn into fellowship with one another as we are all drawn into fellowship with Christ. This called together people is to be one in which all take their part, in which we prefigure the fulfilment of the vision of Revelation & where is gathered before the throne of God a multitude which cannot be numbered, drawn ‘from every nation, from all tribes and peoples and languages.’ And together as the people of God we are called to be that light for the nations, to bring people into the discovery of freedom from their prisons, to make real God’s purposes of justice and righteousness. And so it is that we have listened, so we have heard about people’s sense of calling to be together, supporting and encouraging one another in the work of evangelism, in the nurturing of fruitful discipleship, in the life of prayer and in our desire to draw the young into the life of faith and walk with them in it. And intertwined with all of this is the sense of calling that together we enrich the communities we serve. In the spirit of Jeremiah 29, we desire to seek the welfare of the places where we are. As salt and light, we seek to bring Christ-like savour, flavour and illumination to the world around. 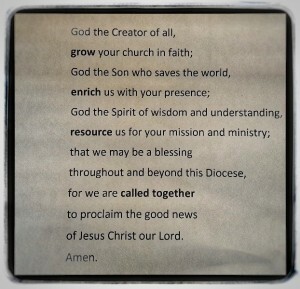 We see our communities and our society, and the crying need for belonging, for direction, for well-being, for Christ. The opportunities to be part of shaping the world around us according to the Kingdom are many, and our sense is that we want to grasp those opportunities. Our church schools continue to be a key element of this, in which some 25,000 children and young people are to be found each day. 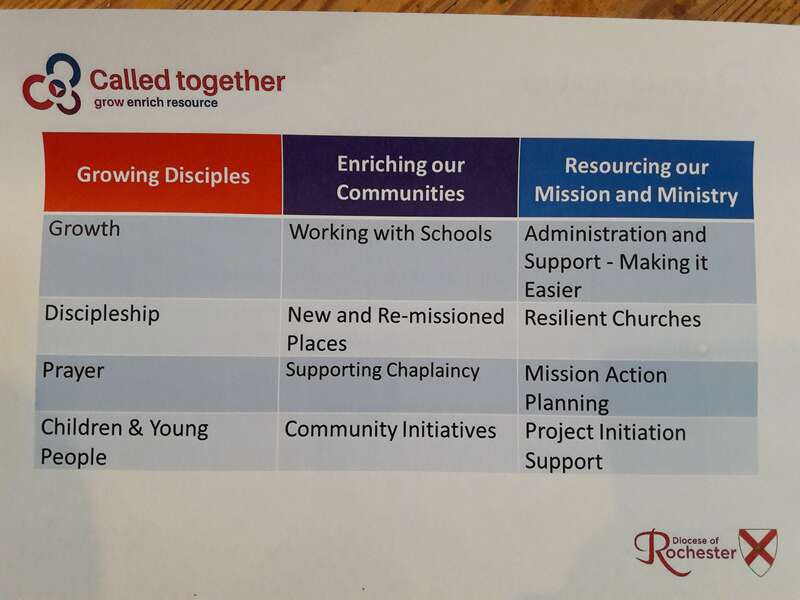 We rejoice that 3 new Church of England schools are part of that picture, one of them, the Bishop Chavasse School, having opened in Tonbridge just last month, and the other 2 at the planning stage. But our pastoral and missionary engagement in and through schools is of course not limited to our church schools, and we hear a clear desire to enhance and support work with schools more widely. Alongside that we know already of our initiatives to plant Christian presence in places where populations have been and are growing and new communities coming into being – King’s Hill, Ebbsfleet, North Gillingham, Paddock Wood and others; we know too of our work to re-mission places such as Chatham Town Centre. And we fully expect more such opportunities (and all the challenges that go with them) over coming years. Chaplaincy is another dimension of this engagement with our communities, reaching into many sectors of society. And with that we have the really exciting work we are already doing and hope to grow at local and diocesan levels in relation to such things as dementia care, homelessness, poverty, debt, fostering and many other engagements where we seek to help one another to be in the name of Christ alongside the most vulnerable in our midst. And here especially, though in other elements of our missionary and pastoral calling too, our being ‘called together’ extends to being together with fellow Christians of other traditions, with Christian organisations, and others within our wider communities who would wish to work with us. There is of course a variety of contexts in which all of this must be seen. There is a cultural context which can in some respects seem very secular and in which explicit religious affiliation is under pressure, as statistics often show. And yet it is also a culture which can surprise us as we discover the doors which open to us, the opportunities which are afforded to us, the people (not least within public life) who welcome our contribution and want to see us thrive. One local Member of Parliament only this week encouraging us not to be apologetic about who we are and what we stand for, but to proclaim and live the Gospel with confidence…. 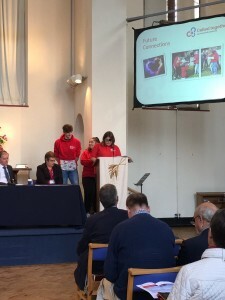 And yes there are all the issues around congregational and ministerial numbers, about money and about buildings – issues on which we and others on our behalf are much engaged locally and nationally. 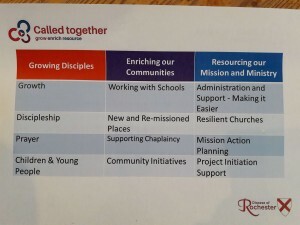 And that’s why, alongside the threads which are to do with ‘Growing Disciples’ and ‘Enriching our Communities’, there is a third group which is to do with the growth and stewardship of our resources for mission and ministry. We envisage significant future work around shaping administrative and other functions so as to be even more supportive of what we all seek to do. We want to give attention to building local church communities that are resilient and sustainable. We want to offer resources that can be used locally to foster prayerful planning for mission and growth; we want to put in place human and other resources to enhance the development of local projects and initiatives.